The Mariana Trench is the greatest man challenge on Earth. (Cos Mt. Everest is like, so been-there done-that.) To finally attain supreme bragging rights of reaching its bottom, a feat last accomplished in the 1960s, a special submersible has been built that can withstand the extreme pressure down below. Though the Triton looks like an average two-man sub for exploring the depths, the real hard science is in the glass bubble surrounding the cockpit. The glass of the passenger compartment only reaches its pressure resistance of 16,000 psi by doing some crazy things. For example, it needs to use fiber optics to relay touch screen control signals through the glass of the 6-foot sphere. And the sphere itself is created to extremely high tolerances of geometric accuracy over 8 months by slowly and carefully heating and cooling the raw materials. These processes are the only thing that let the Triton 36,000–in theory–get as deep as its rated to go. 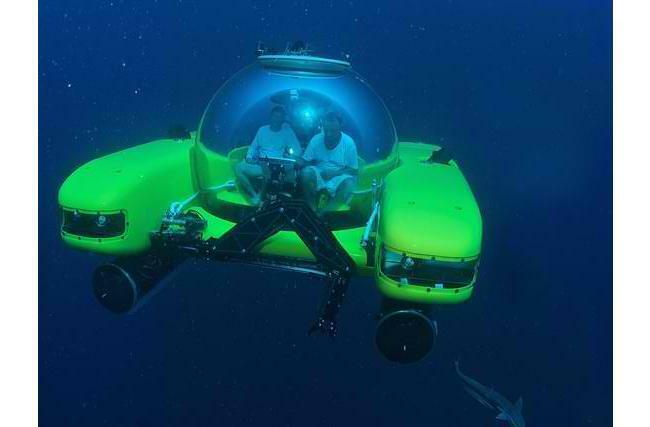 There’s also mention that the triton might work in tandemo—or compete—with Richard Branson’s own sub.